4-Cup coffee makers have become extremely popular nowadays, and there’s a good reason for their popularity. Not everyone needs to brew a full 12-cups of coffee, so these coffee makers can help the coffee lover reduce the amount of coffee they waste. They can simply follow their coffee makers recommendations and brew 4 cups of coffee perfection. A lot of people don’t really know the features they should consider when choosing one of these coffee makers, however. That’s why we’ve decided to list ten of the models that we consider to be the best ones available. And after this top ten list, we’ve put up a guide that coffee enthusiasts aren’t going to want to miss. This 4-cup coffee maker is not only inexpensive, but it also makes some fine coffee. Although it technically brews 4-cups of coffee, these cups are kind of small when compared to standard cups of coffee, so it might be suitable to say that it really only brews 3-cups of coffee. Having said that, this machine does have a few great features that redeem it includes a Grab-a-Cup pause feature, dual water windows and a removable filter basket for easy cleanup. There’s a lot to like about this coffee maker. It has a high-quality stainless steel carafe that’s easy to pour and has a knuckle guard. It has a brew pause feature that allows the consumer to sneak a cup before it has finished brewing and it has a small footprint. Its only real flaw is that it shuts off after being on for 30-minutes, so people who like to slowly sip their coffee might want to look for another model. This 4-cup coffee pot might not have the same convenience level as using an automatic machine, but it does make a mighty fine pot of espresso. It’s made from metal and has quality plastic handles that don’t get hot and make it easy to pour the coffee. This pot can be used on all types of stovetops, including induction models, so anyone can enjoy a nice hot cup of espresso anytime they want to whip up a small pot. The first thing that should be noted about this espresso pot is that it makes 4 espresso cups worth of coffee. This means that it makes 8-ounces of coffee since a standard espresso cup holds 2-ounces of espresso. With that being said, this pot is well made, brews a brilliant pot of espresso and fits on most stovetops. It’s not dishwasher safe and has to be hand-washed, but it’s still easy to use. This small 4-cup coffee machine can make 4 cups of coffee in under 2-minutes and do it without making a whole lot of noise. This is partially due to the fact that it is a 600-Watt unit and partially due to the fact that the cups it brews are small cups. It brews about four 4-ounce cups of coffee, so it really only produces about 16-ounces of Java in all. And it also has a few nice features which include a removable filter basket, a built-in warming plate, and a water reservoir window that makes it quite easy to use. This simple and silent coffee maker can brew 4 5-ounce cups of coffee in about 1-minute or maybe just a little bit longer. It has 600-Watts of rated power, but it is safe enough to use at home or at the office. This unit has a simple on/off switch that has a built-in light and tells the user when the machine is in operation. And since this coffee maker is made using BPA-free plastics, it’s capable of producing coffee that’s safe for everyone to drink. Anyone looking for a small coffee pot that produces 4-cups of coffee might want to take a look at this machine. It’s small, compact and does a great job of brewing coffee. It has an on/off indicator light that lets the user know when it’s turned on, and it has a grab-a-cup auto-pause feature that pauses the brewing so the user can grab a cup. This unit also has a removable filter basket for easy cleanup and has a warming plate that keeps the carafe warm until it’s needed. And although the carafe tends to drip when it’s poured, it’s still easy to use for a cup of coffee. This coffee pot is only 9.64-inches high, 6.14-inches deep and 7.12-inches wide. That’s just big enough for it to produce 4-cups of coffee when it’s needed. This programmable unit has an on/off indicator that alerts the user to the machine’s current status, and it also has a brewing pause feature that allows the user to sneak a cup when necessary. This machine also has a brew delay function, dual water windows, and a removable filter basket. Although the lid to the machine can be a pain to close and requires the user to pay attention when closing it, the rest of the unit is pretty solid and works well. Sometimes all that’s needed to make 4-cups of beautiful espresso is the right machine and a willingness to make the espresso using the Italian brewing method. And this 4-cup pot might just be the right tool for the job. This pot is made from 18/10 stainless steel and is capable of being used on either electric or gas stovetops, so just about everyone can enjoy a nice steaming cup of espresso. This product is also dishwasher safe, and its stay-cool handle makes it very easy to use. All things considered, it’s the perfect 4-cup coffee maker for making espresso for yourself and maybe a friend. Simplicity is the name of the game with this high-quality coffee maker. It brews up 4-cups of coffee and has a number of features which make it simple to use. For instance, it has a gold-tone filter that allows the consumer to use it without having to buy paper filters all of the time. It also has dual water windows that allow the consumer to see the water level of the machine and it has a brewing pause feature. Although it seems to take longer to brew a cup than other 4-cup machines, it does brew a great cup of Joe when it does finish brewing. 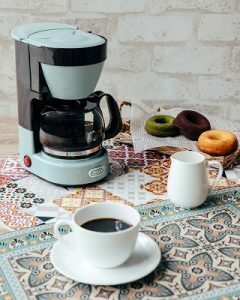 If you’re reading this guide, then you are likely looking to buy the best 4-cup coffee maker available, which isn’t too bad of an idea for most people. 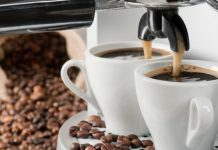 After all, it seems like a lot of good coffee is poured down the drain every day because coffee drinkers don’t drink the full pot of coffee they just brewed. Being able to brew only 4-cups of coffee at a time is a real convenience that a lot of people should consider. 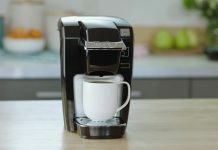 This guide will delve into the wonderful world of 4-cup coffee machines to point out the features that any coffee connoisseur should consider when they’re looking for a model for their home. Let’s jump right into it and find the features that should be considered before buying your next 4-cup Java maker. We’re going to be brutally honest here—not everyone needs an automatic 4-cup machine. Some people are better off by choosing one of the stove-top espresso models that can be found. In fact, we listed a couple of models above, so that people can choose whether they want an automatic machine or want to use the Italian method of making coffee. Of course, when it comes to a choice between these two types of models, there really isn’t a right or wrong decision. The consumer should choose the one that they feel comfortable using. Another thing that’s worth considering is the carafe on the automatic coffee maker. Although most models are made out of glass, there are some models that are made out of metal—specifically stainless steel. Stainless steel carafes tend to be more durable and to stay warmer longer than glass models. They also tend to drive the price of the coffee maker a little bit, so it’s certainly something that should be carefully considered before proceeding. The next thing you may want to consider is whether you’re purchasing a model with a permanent filter built into, it or if you are going to want to use a paper filter. Once again, this is a personal choice and there’s no right or wrong answer, so the consumer should buy one that’s appropriate for their personal needs. 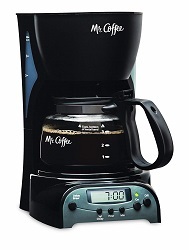 In our experience, there are really two different types of machines in this automatic coffee maker category. There are models which simply turn on with the press of a button, and there are those which have a built-in time. Although the models which just have a switch are easy to operate and are usually inexpensive, you may not want to discount the utility of getting a model with a timer. With a timer, you can fill the machine up the night before, and the timer will automatically brew your 4-cups of coffee. That way, you can have your coffee ready as soon as you open your eyes. And that’s always a good thing, trust us. Obviously, you don’t have to worry about a pause feature if you’re thinking of buying a stovetop espresso carafe, but if you’re thinking of buying an automatic model, it’s something to consider. The pause feature on most automatic coffee makers allows you to sneak a cup of coffee before the brewing cycle is complete. 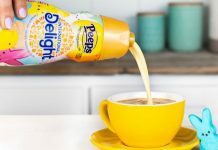 Also known as a Sneak-a-cup feature, this allows you to grab your first cup without having to worry about the machine brewing coffee all over your counter. Of course, some people may not feel like they need this feature because they are only brewing 4-cups of coffee and that doesn’t take a whole lot of time, so it’s really up to them to determine if it’s a useful feature or not. Finally, the last thing that you’ll want to consider is the cost of the unit. These models range in price from about $15, all the way up to $50 or more. Of course, the more features found on the coffee maker and the better made it is, the higher it’s going to cost. So be sure to pick a model with the features that you need in the price range that you like. That will enable you to buy the best machine for you.